Tuesday November 4, 2014: 10 new birds of 5 species; 12 recaps. No new species. Bird of the day is Black-capped Chickadee with 5 new bands. It was an awfully slow day, so we took advantage of the nice weather to close up the station for the fall. We took in all the nets and clothespins, as we said goodbye to another fall season. We ended the season with 4777 birds of 89 species (and one hybrid form), and 1368 recaptures. We never did capture a chickadee irruption, but we did band a respectable 110 Black-capped Chickadees, completely eclipsing last fall’s total of 19. We also outdid last fall’s total of White-throated Sparrows (947 v. 848), Ruby-crowned Kinglet (446 v. 287), Pine Siskin (115 v. 0), and American Goldfinch (152 v. 20). Magnolia Warblers were down (194 v. 284). Overall, it seemed that the season started slow but picked up as time went along. We are already eagerly anticipating spring, and the return of the colorful (no longer confusing) warblers! We hope to see you all back in April. Monday November 3, 2014: 46 new birds of 13 species, 9 recaps. No new species. Bird of the day was American Goldfinch with 26 new bands. Banding continues for a few more days at BBBO, as the weather continues to be mild and cooperative. It’s sort of “hit-or-miss” at this time of year, as 23 of our new bands were captured in a single net on a single net run (21 goldfinches, 1 siskin, and 1 junco – all in net 15 at hour 1). Even without that flock, however, our day would still have been interesting. We recaptured a Downy Woodpecker now in its third year, and we captured both a new Nashville and a new Myrtle Warbler. 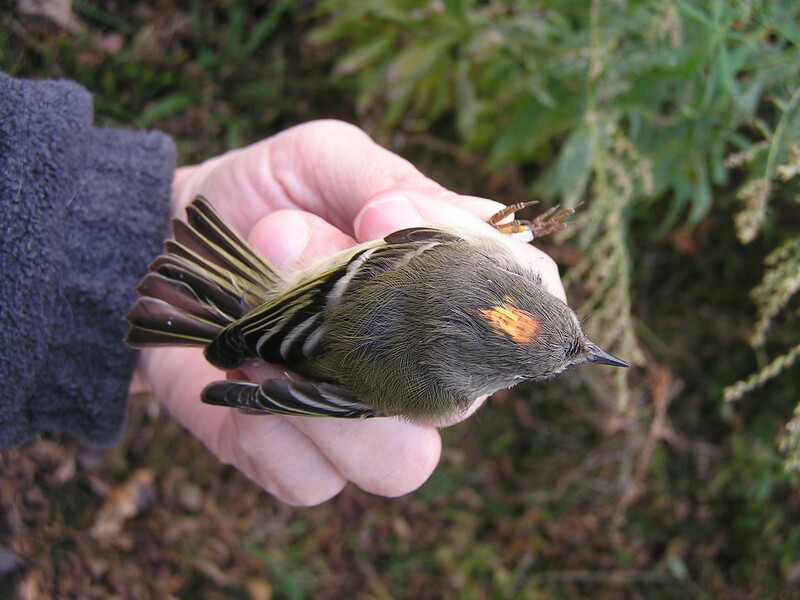 Most interestingly, we captured two Ruby-crowned Kinglets . . . both of which had orange crowns. We see this from time to time, but it was quite a coincidence that we captured two on the same day. Whether this abnormality is diet related or the result of a genetic condition preventing the composition or deposition of certain carotenoids, I can’t say!